2002 Bachelor of Science Honours, School of Life Sciences, University of Queensland. "Parasitic worms (Digenea: Bucephalidae) found in the cleaning wrasse, Labroides dimidiatus". Supervisors: Dr Alexandra Grutter and Dr Tom Cribb. 2003 Ron Kenny Award for best student presentation at Australian Marine Science Association (AMSA) 2003 conference. 2006 Biological and Chemical Sciences Faculty Award to attend and present at the International Congress of Parasitology (ICOPA) 2006 meeting. Research Project: Conor completed his honours in 2002 under the supervison of Dr Lexa Grutter and Dr Tom Cribb. 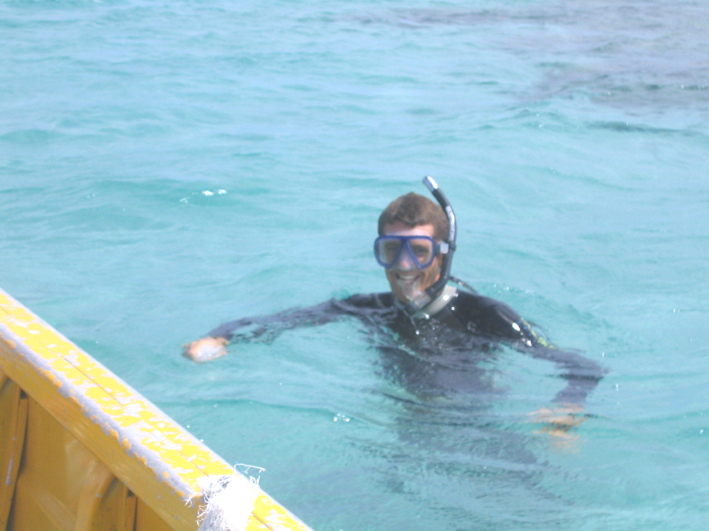 He then worked for 12 months as Lexa's Research Assistant in the Coral Reef Ecology Laboratory at UQ. He then commenced his PhD in January 2004 once again under the supervision of Dr Lexa Grutter and Dr Tom Cribb. Honours Project: "A new species of parasitic worm (Digenea: Bucephalidae) found in the cleaning wrasse, Labroides dimidiatus"
I found bucephalid parasites in the guts of cleaner fish and described this species. As bucephalids usually parasitise piscivorous fish, this discovery suggested that trasmission could also occur during cleaning behaviour by direct consumption of the parasite's larval intermediate stages. When I examined other wrasses from the tropical pacific, bucephalids were only found in species that participated in cleaning behaviour. The results from this study suggest that cleaning behaviour may be involved in the transmission of bucephalids in wrasses and that this phenomena is geographically widespread. PhD project: "The effect of micropredators on reef fish larvae"
Conor is examining the effects that temporary or micropredator parasitic isopods have on reef fish larvae. The project will identify micropredatory isopods and test whether theyare important in structuring the settlement patterns of larval fish and the degree to which they impact their survival. Conor gives a coral trout a freshwater bath. Conor releases fish into the aquarium. Conor with a bottle trap. Jones, C. Grutter, A.S. (2005) Cultured parasitic isopods (Gnathia sp.) reduce haematocrit in captive blackeye thicklip (Labridae) on the Great Barrier Reef . Journal of Fish Biology. 66: 860-864. Jones CM, Miller TL, Grutter AS , Cribb TH (2008) Natatory-stage cymothoid isopods: description, molecular identification and evolution of attachment. International Journal for Parasitology, 38: 477-491. Penfold, R., Grutter, A.S., Kuris, A.M., McCormick M.I., Jones, C.M. (2008) Interactions between juvenile marine fish and gnathiid ispods: predation versus micropredation. Marine Ecology Progress Series 357: 111-119. Jones, C., Grutter, A.S. (2008) Reef based micropredators affect the growth and survival of recently settled damselfishes. Coral Reefs, 27(3): 677-684. Conor with larval fish cage.